Visit Ngong Ping 360 from 1 December 2017 to 1 January 2018 to experience the enchanting beauty of falling snow! Bring your family and friends to explore the natural wonders of Lantau and enjoy a beautiful white Christmas. In addition to the daily snowfall effects at Ngong Ping 360, you can also explore the nature attractions across Lantau. Plan a relaxing day out for your friends and families! A specially decorated cable car installation is set up at Ngong Ping to accentuate the festivity. Snowfall effects have been scheduled at designated time in Village Square and the Bodhi Tree. The snowflakes in the air will create the experience of a white Christmas, as if guests are in the middle of a European Christmas market. 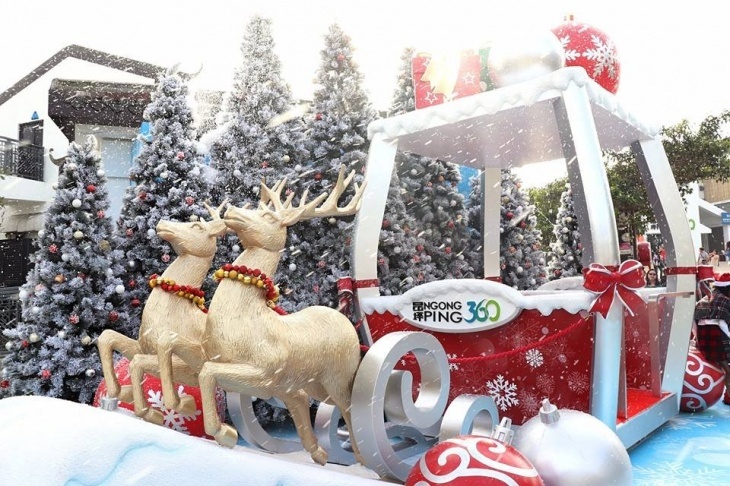 The Christmas centerpiece decoration with falling snow is the best photo taking spot during this festive season at Ngong Ping Village. Ngong Ping Village will be presenting live Christmas carols this December. Enjoy the best of the festival with snowflakes and music in the air. For more information and enquiries, please call the Guest Service Hotline of Ngong Ping 360 Limited at +(852)3666-0606. Online Ticket Booking – Advanced booking can be made up to 14 days prior to visits. Reserve your tickets now! Terms and Conditions of 80% off exclusive offers for local children!